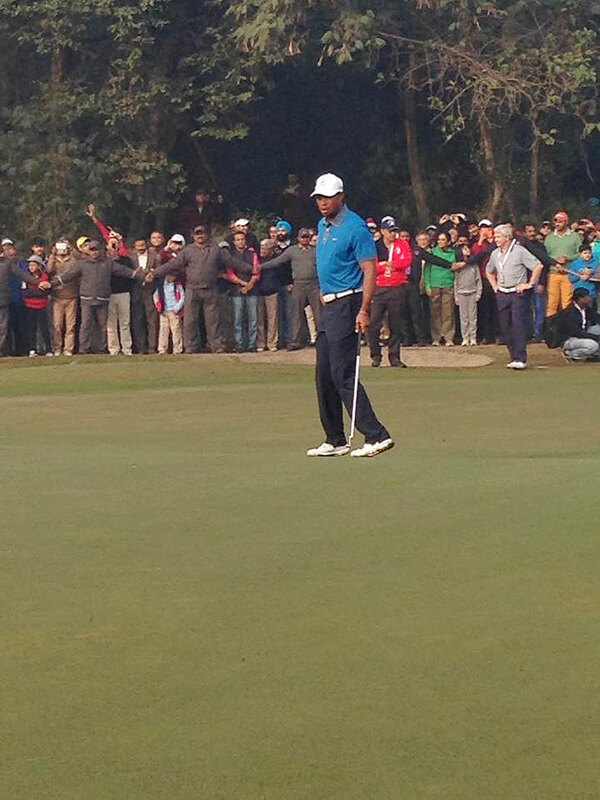 Tiger Woods was the centre of attraction as scores of golf fans and journalists thronged the Delhi Golf Club to get a glimpse of the legendary golfer in action, reports Manu Shankar. 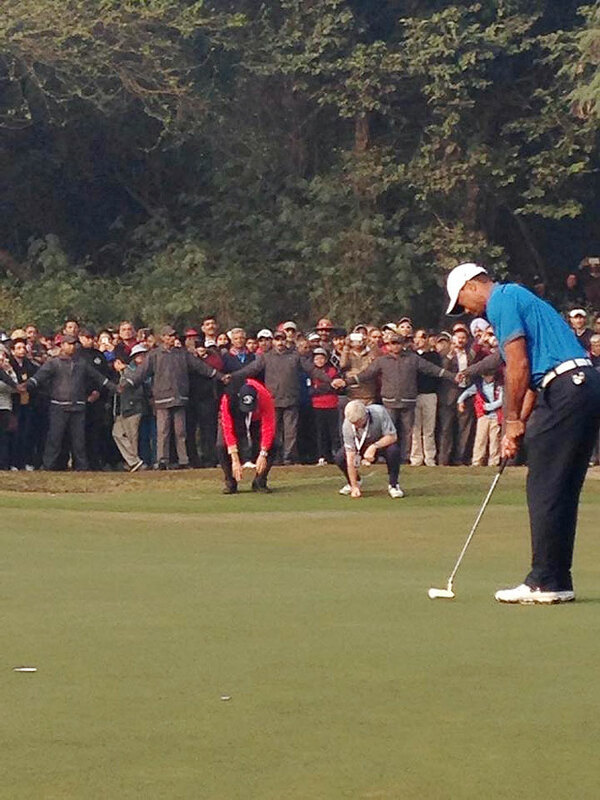 It's not a sight that you would see everyday -- Tiger Woods teeing off at the Delhi Golf Club. Donning a blue tee-shirt, black trousers and white cap, Woods hit the greens for the first time in India, leaving many in awe. No wonder there was a huge line at the DGC, with some trying to get in, some wanting to find out if a film star was shooting inside, while others were trying to figure out what the whole hullaballoo was about. The world No. 1 golfer started off by playing the first nine holes against Hero MotoCorp CEO and Managing Director, Pawan Munjal. Woods missed an eagle putt but birdied the par 5 hole. In the second hole, the American landed a shot just four feet away from the pin to miss it by a whisker. As sports presenter Alan Wilkins welcomed Tiger, querying if he was nervous, a gentle smile broke on his face. The 'Go Tiger' and 'We love you Tiger' chants were impossible to miss as he was greeted with vociferous applause. Woods was soon joined by Supreme Court judge Vikramjit Sen and DLF vice-president Rajiv Singh for the 10th and 11th holes. Sharmila Nicollete, 22, got a chance to face off against Woods on the 12th and 13th holes. Shiv Kapur and Anirban Lahiri played with Woods in a special skill challenger, which was won by the Kapur on the 16th, 17, and 18th holes. "It's amazing to be on the same greens as Tiger," Kapur said after their session. 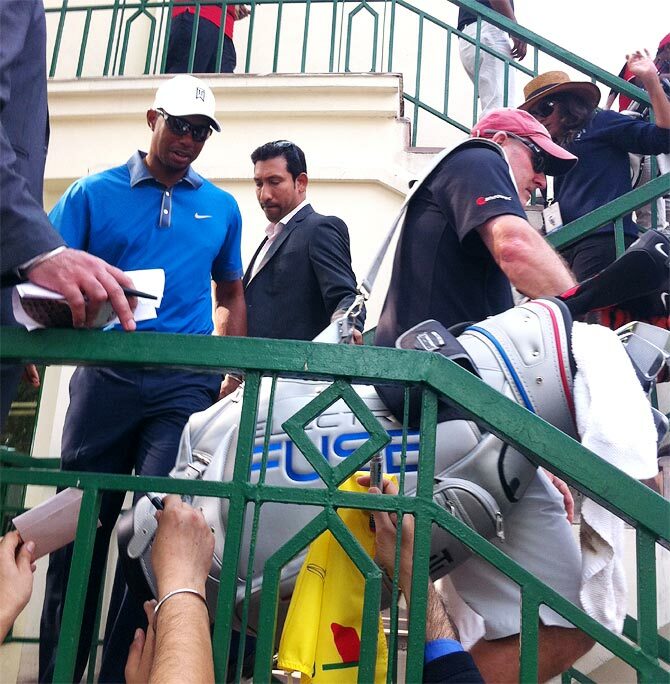 When quizzed about the interaction that he and Woods had in the middle, Kapur said, "We talked about various things. He was impressed with the DGC and said the course was pretty similar to the one he grew up playing on. "Since Tiger is so particular about his diet, we chatted about trying out various Indian cuisines." 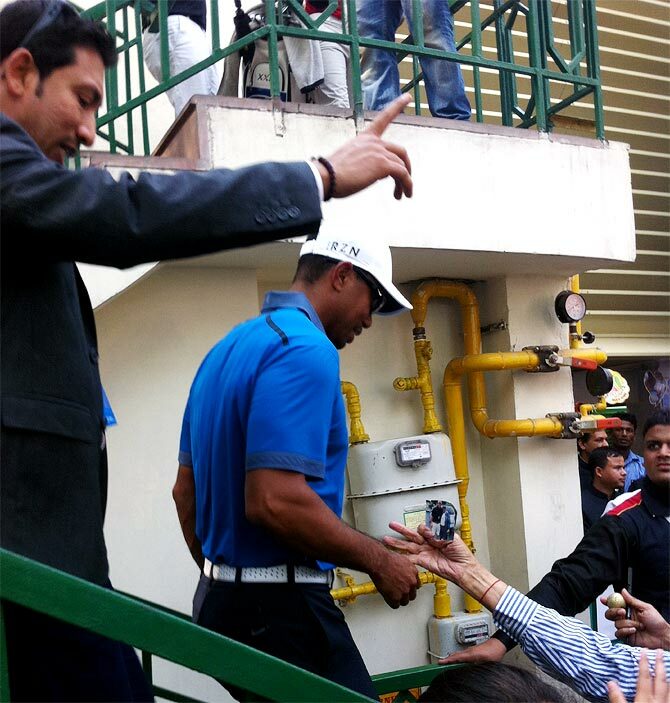 Lahiri was amazed by the legendary golfer's humility. "He is so humble. He doesn't have any airs about being such a top player." Nicollete seemed to be the one who was most nervous around Woods. "It was an amazing experience. I was thrilled to play with him and also nervous at the same time," she said. Woods also got a chance to meet India's cricketing legend Sachin Tendulkar, who was in New Delhi to receive the Bharat Ratna award and was staying in the same hotel. 'Just met a cricket legend and his family. Sachin Tendulkar @sachin_rt was so cool and loved being welcomed to India,' he later tweeted about it. Meet golfer Tiger Woods's new lady love!